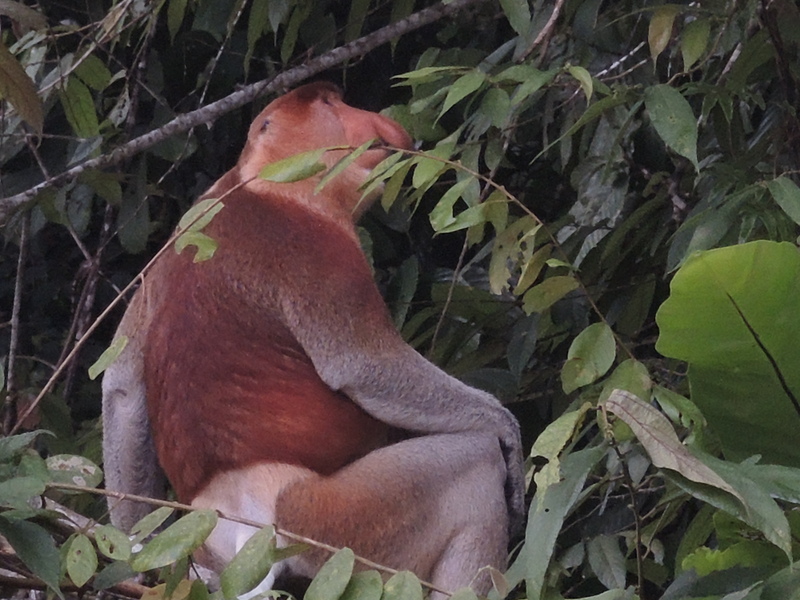 Before I started researching my trip to Malaysia I don’t think I had ever heard of the proboscis monkey. As soon as I saw a photo of one, I knew I wanted to see it. They are endemic to the south-east Asian island of Borneo. Usually the monkeys are spotted in coastal areas and near rivers. They prefer to be near a water source and typically don’t stray more than a kilometer from water. And they can swim. However, they spend most of their time in trees. During the morning the proboscis forage for food, eating mostly leaves and fruit. The rest of the hours during the day involve resting, traveling, eating, and keeping watch for crocodiles, clouded leopards, monitor lizards, pythons, and eagles. Yikes that’s a lot of predators. In the evening they return to the river to eat again and then sleep in the trees. It’s easy to identify one in the wild—just look at the nose. The nose isn’t as large, but still bigger than most monkeys. We saw a few groups along the Kinabatangan River during our evening cruises. Here you can see them hanging about. Then it was time for them to settle down for the night. Such odd, but wonderful creatures. 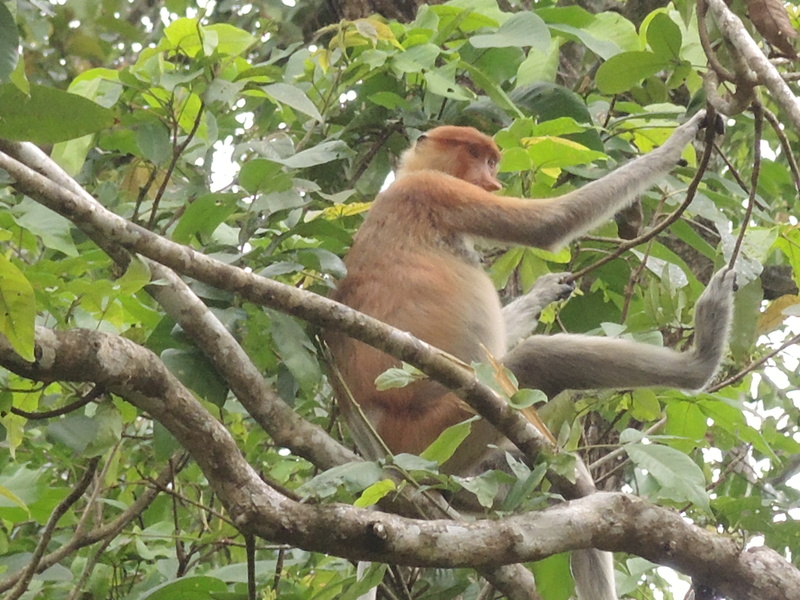 This entry was posted in Travel Photos, Travel Stories and tagged Animals, Asia, Borneo, Kinabatangan River, Life, Malaysia, Nature, Photography, Photos, Proboscis monkey, Sabah, South East Asia, Travel, Travel Blog, Travel Journal, Travel Photos, Wildlife, Wildlife Photography. Bookmark the permalink. Oh boy, ALF has lots of relatives over there doesn’t he? LOL!! How do they ever rest with that many scary creatures looking to eat them for supper? I would be having constant anxiety attacks :). Me too. Att jumped on my desk earlier today and I nearly fainted. Bad Atticus!! Don’t scare mommy, well not too much anyway :). And tell him to stop biting me! Thanks, but he left the room. It must be his feeding time. Oh my goodness I love them. What great shots and what a great adventure! I am trying to catch up with your posts from the past couple of weeks—I have a lot to read!!! I love these guys!!! They are incredible animals and it was a kick to sit in the boat and watch them jump around in the trees. I hope your life has slowed down some. Goodness just reading all that you’ve been up to made me want to take a nap. Oh Carlton. Your stories about him always make me smile. I just wanna know who gave them that ridiculous name… surely a hooter like that was quite enough! and it is a hooter! I think they’re beautiful, nothing wrong with a big nose, I say! Well if you are going to have a big nose, why not go all out have one like this. They are beautiful creatures, but people give me a hard time since I think that about most critters no matter what. I’ve seen them on tv – they are so cool. I would love to see one in real life. I hope you do Carol. They are a sight to see. I’m always amazed at how closely primates resemble humans – just look at the way they sit and interact. Very human-like. Of course that nose is a different story! I’ve seen people with large noses, but not quite like this. I didn’t know it is callef like that. We have different name for thay monkey…but I can’t get it out of my brain right now. Dufan’s monkey–I’ll have to remember that! its name is Bekantan Monkey or Dutch Monkey. Some call it Dutch Monkey because it looks like a westerner, long nose and blonde. I love the reason for calling it a Dutch Monkey. I’m not Dutch but I had to go look in the mirror to see if my nose is too big. Wow, there are so many of them! How thrilling to be able to see this. I agree. I’m trying to think of an actor years ago who had a enormous nose–he only starred in black and white films and he hated working with kids. Gosh, I just can’t think of his name. It’ll come to me. I think it was Jimmy Durante seen here. Yes! Thanks that was bugging me. I thought the same thing, but couldn’t remember his name. Francine helped me out with the name.